Dr. Pickard points out that the news media’s primary goal is not to distribute information to the public but to garner ratings and revenues. Here, he traces the history of how profit undermined public service in the news media. 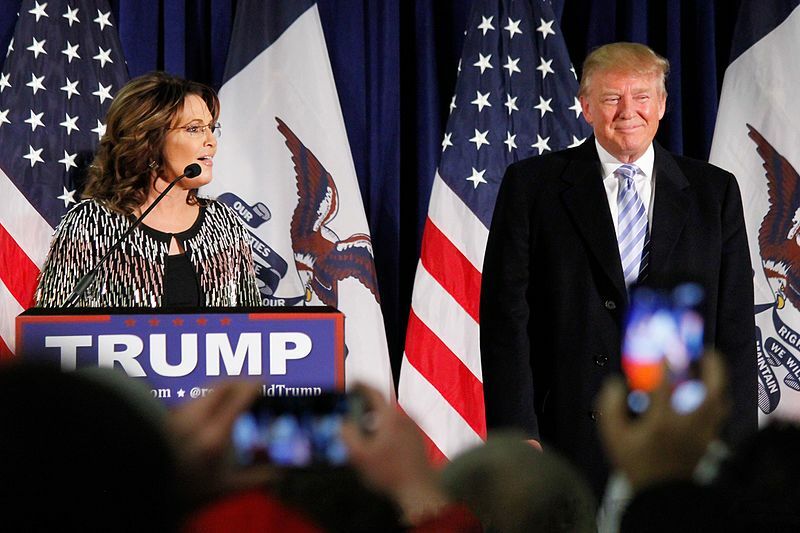 Donald Trump’s 2016 campaign will likely preoccupy future historians for years to come. 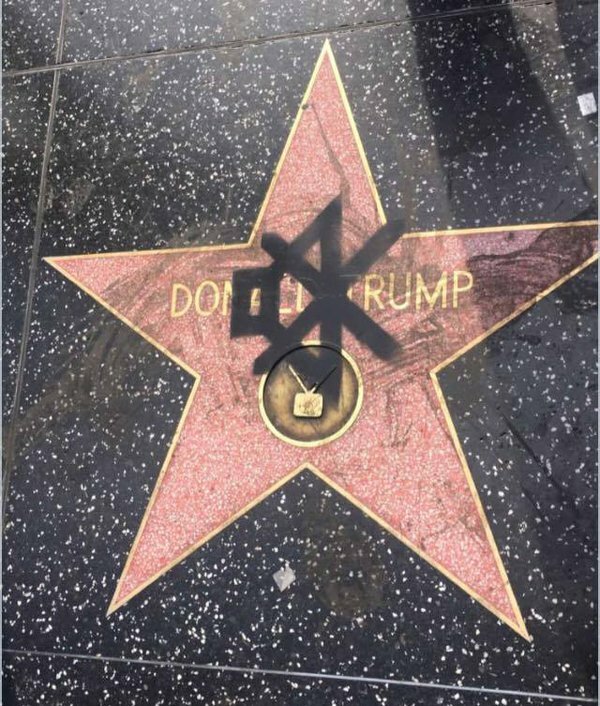 While a number of factors contributed to his rise—including the growing power of social media, a latent racism and nativism within sections of the American public, and economic malaise resulting from Republican and Democratic administrations’ trade policies—the media deserve special scrutiny for their role in accelerating Trump’s candidacy, most obviously because they set agendas and frame political debates each election cycle. 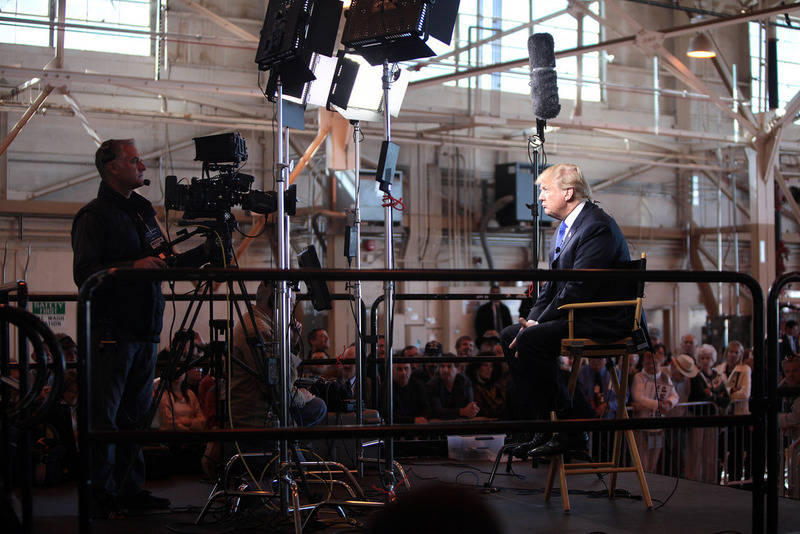 News media’s constant coverage has boosted Trump’s visibility and helped popularize him, even in aggressive confrontations with the candidate. The benefit, however, is mutual. 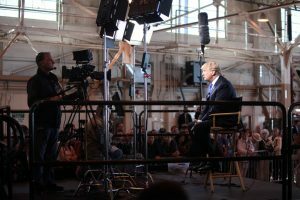 As Trump attacks the press—mocking and feuding with journalists, threatening to change libel laws, holding campaign events where reporters are corralled and roughed up—he still serves the media well. That’s because the news organizations covering Trump, particularly television news, are reaping incredible amounts of money from their election coverage. Cable news organizations are expected to make a record-breaking $2.5 billion this election season. This profit motive helps explain the constant media exposure of Trump that greatly advantaged his campaign over his competitors’, especially in the primary season’s early days. A study on newsworthiness calculated that, during 2015, Trump received 327 minutes of nightly broadcast network news coverage, compared with Hillary Clinton’s 121 minutes and Bernie Sanders’ 20 minutes. The New York Times reported that Trump received nearly $2 billion in free media coverage during his primary campaign. As the Republican nominee for president, he’s since become even more ubiquitous. 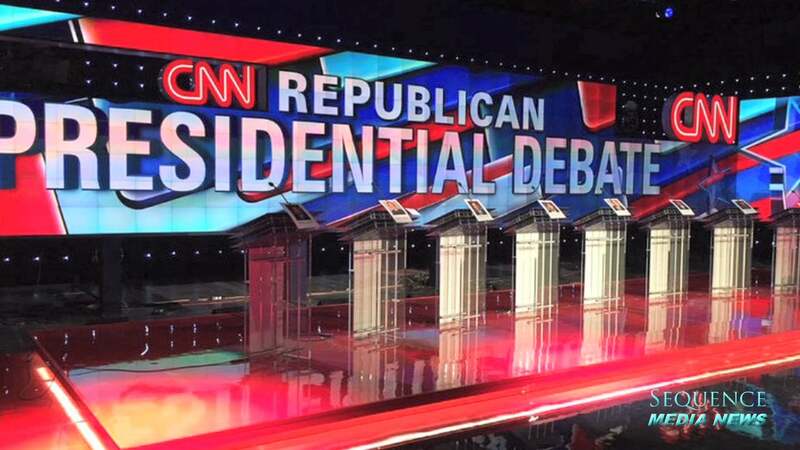 The stage before the 10th Republican Presidential Debate in February 2016. 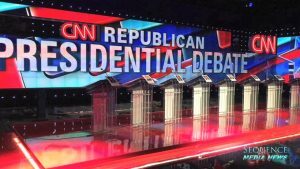 The debate was the only one sponsored by a Spanish language outlet, Telemundo, and CNN’s third debate. The Republican Presidential Debates brought in record audiences. Such brazen disregard for the role of the press in a democratic society lays bare structural problems in the U.S. media system. Compared to other countries’ media systems, America’s is extremely commercialized and our weakly-supported public media is unusual when compared to other nations. In fact, other democracies have developed strikingly different media systems, which aren’t simply reflections of taste, culture, and style. Known as the “Big Six,” these media conglomerates control 90% of the news media in the United States. One the left from top to bottom, the Comcast Corporation logo, the Walt Disney Company logo, and the Time Warner Incorporated logo. On the right from top to bottom, the 21st Century Fox logo, the CBS Corporation logo, and the Viacom logo. This raises a number of troubling questions. How did Americans inherit such a system—one that, in many sectors, is dominated by a few corporations, is only lightly regulated by public interest mandates, and is predominantly commercial, with only weak public alternatives? Is this really the system—one so beholden to brute market forces—Americans want? These are historical questions. A look at modern media history, particularly the 1940s, shows that the American system didn’t emerge from entirely democratic decisions. It arose instead from a history of commercial interests winning out over others. This history is marked by pronounced conflict, in which activists, industries, and regulators all fought over the fundamental nature and democratic role of the American media system. Profit-driven media in the United States began on a wide scale in the mid-19th century when technological changes and a growing readership produced the “penny press.” As these cheap, mass-circulation newspapers commercialized and began to rely heavily on advertising revenue, sensationalistic reporting became more pronounced. 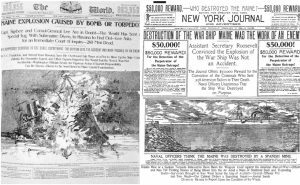 What came to be called “yellow journalism” in the late 19th century featured salaciousness, dishonest reporting, and sensationalism as a way to sell papers. Two of the most infamous examples of “yellow journalism,” Joseph Pulitzer’s New York World (left) and William Randolph Hearst’s New York Journal (right) competed for sales by sensationalizing conditions in Cuba in the lead up to the Spanish-American War in 1898. 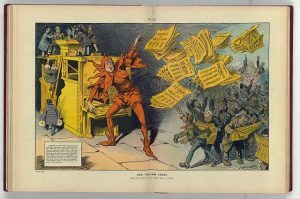 In the face of public criticism, professional norms based on objective and fact-based reporting began to crystallize in the early 20th century to prevent unfettered commercialism from completely debasing the news. Nonetheless, American journalism typically relied on advertising for roughly 80% of its revenues, much higher than its counterparts around the world. 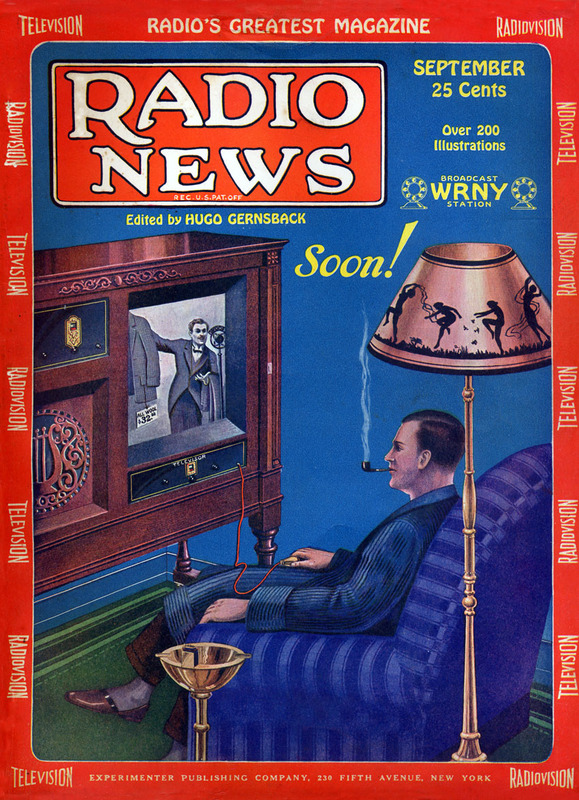 Commercial radio developed in the 1920s, offering an alternative to print journalism. And while there are parallels between the two, there are also important differences. The rules of this new media were officially codified by the 1934 Communications Act, which established the main regulatory agency for broadcast media, the Federal Communications Commission (FCC). 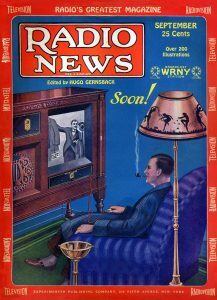 The FCC was preceded by the Federal Radio Commission (FRC), a temporary agency founded in 1927 to provide regulatory stability, particularly around technical issues, for the increasingly contested airwaves. Like the FRC, the FCC was tasked with granting licenses and ensuring that broadcasting stations served the public interest. But programming regulation was thorny terrain because the FCC was forbidden by law to practice censorship. Moreover, the standards by which licensees were judged remained ill-defined, thereby inviting charges of arbitrariness. Any FCC attempt to establish public interest standards invited conflict with the commercial broadcast industry, drawing accusations of paternalism and attacks on free speech. Profit and public service were set at odds. Through the Communications Act, Congress largely sanctioned commercial broadcasting at the expense of non-profit alternatives pushed by educators and reformers. As a result, a strong public broadcasting system did not take root during American radio’s early days as it did in many other democratic nations. American radio was quickly subsumed by the oligopoly of large networks. 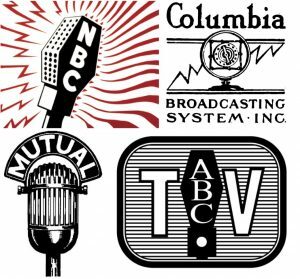 By the mid-1940s, the broadcast industry was dominated by four networks: the National Broadcasting Company (NBC), the Columbia Broadcasting System (CBS), the Mutual Broadcasting System (MBS), and the American Broadcasting Company (ABC, which had been NBC’s “Blue Network” until 1943). Whenever the social mission of public broadcast systems in other countries—like the United Kingdom’s BBC (British Broadcasting Corporation)—was questioned, the U.S. model served as a cautionary tale of what not to do. The National Broadcasting Corporation’s first logo in 1943 (top left). The Columbia Broadcasting Corporation logo from 1927 to 1931 (top right). 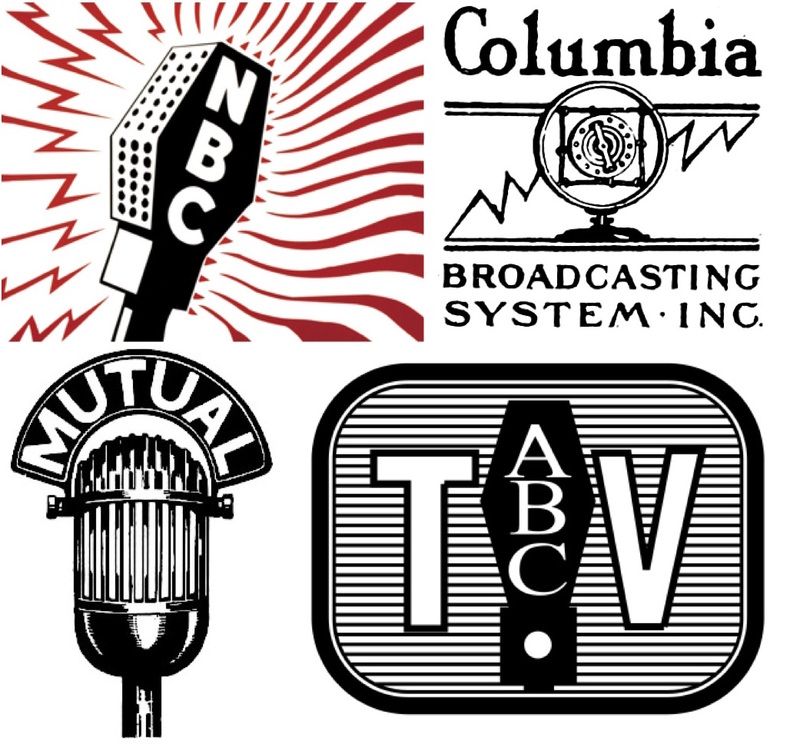 Mutual Broadcasting System’s 1934 logo (bottom left). American Broadcasting Corporation logo from 1964 (bottom right). Although these pre-television years are celebrated as radio’s golden age, the medium’s public service responsibilities remained vague. Most broadcasters viewed their primary role as selling airtime to advertisers who developed programs and promoted their products. Advertisers—usually called sponsors—would buy entire time segments of programming from a commercial broadcaster, usually an affiliate of one of the major networks. 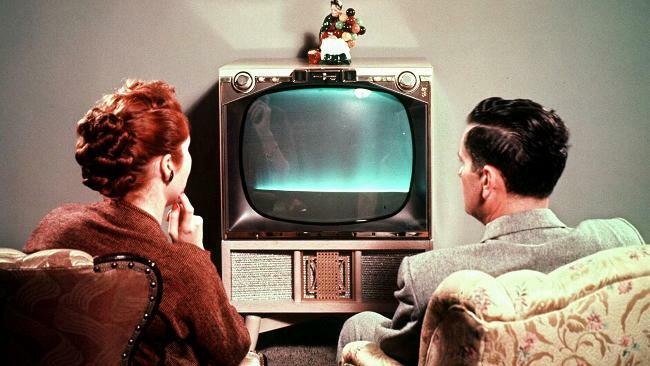 Shows like soap operas, the term given to 1940s radio serials due to their frequent soap company sponsorship, gave sponsors free rein to air numerous commercials and even to influence actual programming. The FCC at this time was reactive rather than proactive. 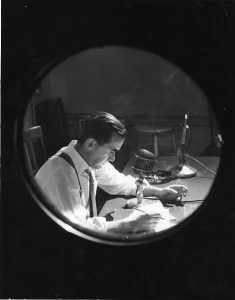 Despite its New Deal origins, the agency didn’t pursue a reformist or public agenda, and its early years saw few policy challenges to American radio’s increasing commercialization. Although the 1934 Communications Act gave the FCC a mandate to serve the always-contested “public interest, convenience and necessity,” the commission was largely non-confrontational toward commercial broadcasters. 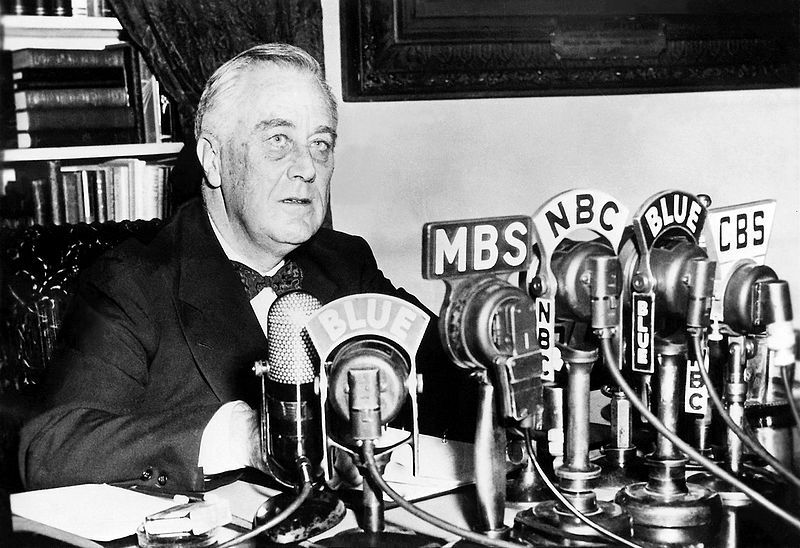 President Franklin D. Roosevelt’s cozy relationship with broadcasters may have further encouraged complacency. But this all began to change by the late 1930s when newspapers rapidly bought up radio stations and, in some cases, exerted editorial authority over programming. 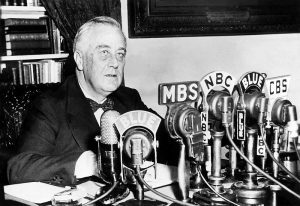 FDR saw this media consolidation as a threat to democracy and a political challenge to his New Deal agenda. He needed a proxy to make an intervention. 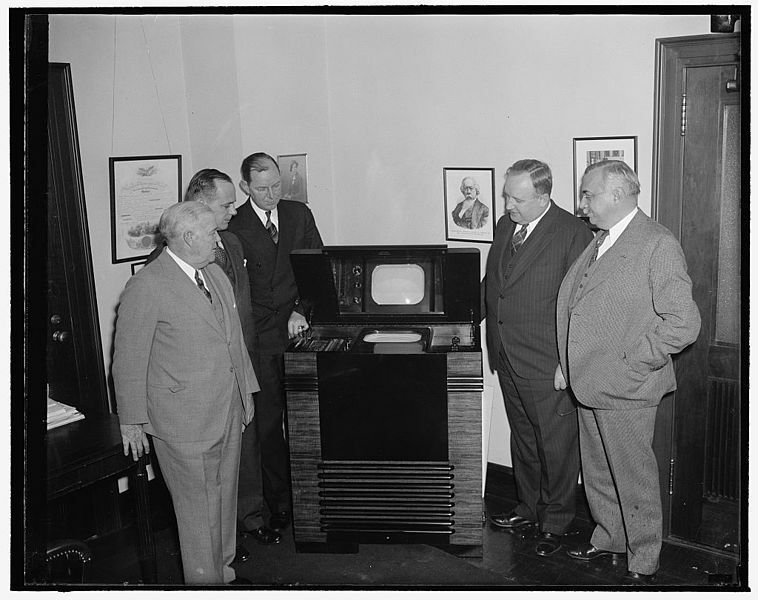 James Lawrence (Larry) Fly’s appointment to the FCC chairmanship in July 1939 marked a turning point for the commission. Fly initiated a nearly decade-long progressive regulatory orientation for American media policy. Fly helped transform the FCC from being a mere “traffic cop” concerned only with technical requirements into an institution that disciplined broadcasters for failing to fulfill their public-service responsibility. He believed that such programming objectives required government-driven structural interventions. Under Fly, the New Deal arrived late and stayed longer at the FCC compared to other areas of government. As the New Deal foundered elsewhere, Fly and the FCC represented social democracy’s last stand. Under new leadership in the early 1940s, the FCC confronted media corporations and aggressively defended public interest principles while facing considerable political opposition. Its mission aligned with the objectives of various social movements and was buoyed by growing criticism, especially public distaste for radio commercials. While the commercial system was fairly well established by the 1940s, during and immediately after World War II, a three-pronged assault against commercial media arose from above and below, led by grassroots activists, progressive policy makers, and everyday American listeners and readers who were upset with specific aspects of their media system. Much of their criticism sounds familiar to us today: concerns about excessive commercialism, misrepresentations of marginalized people and ideas, lack of minority-owned media, media concentration, and a loss of local journalism. These critiques gave rise to a nascent media reform movement as coalitions composed of labor unions, civil rights organizers, civil libertarians, disaffected intellectuals, progressive groups, educators, and religious organizations sought to reform the media system. The 1940s were a critical juncture for American media. In 1943, the FCC took anti-monopoly measures against chain broadcasters, which forced NBC to divest itself of a major network (which became ABC). Two years later, the Supreme Court issued an antitrust ruling affirming the need for “diverse and antagonistic sources” against the Associated Press. 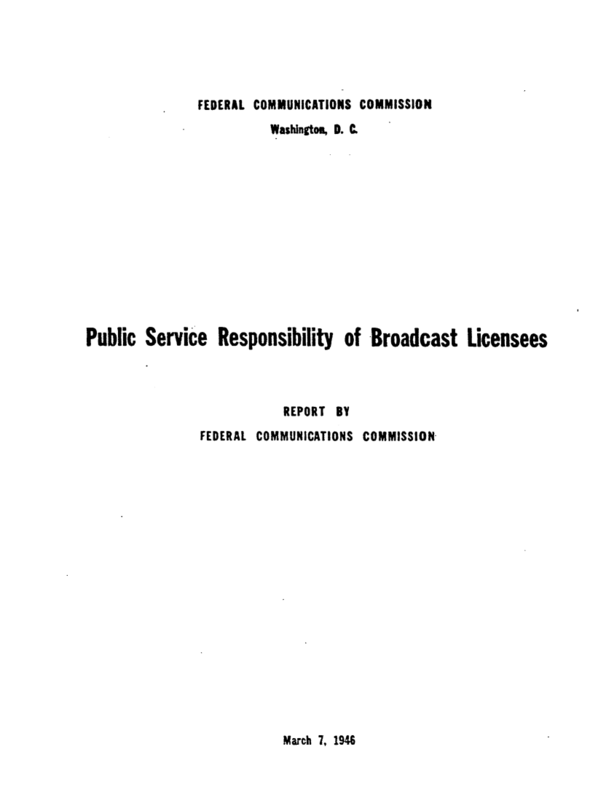 In 1946 the FCC published its “Blue Book,” which mandated broadcasters’ public service responsibilities. The Hutchins Commission on Freedom of the Press established journalism’s democratic benchmarks in 1947. And finally, in 1949, the FCC issued its Fairness Doctrine outlining key public interest obligations for broadcasters. Not all of these initiatives were successful, but they all sought to reorient the balance between profit and service in the American news media. They addressed a key question: What did commercial broadcasters owe the public in return for their free and monopolistic use of the public airwaves? They also all shared an expansive view of the First Amendment that protected the audience’s positive right to information as much as broadcasters and publishers’ negative rights protecting their speech and property from government intrusion. Taken together, these policy interventions composed a broader impulse, one defined by a social democratic vision of media that emphasized its public service mission instead of treating it as only a business commodity. Privileging social benefits over property rights, this perspective assesses a media system’s value by how it benefits all of society rather than how it serves individual freedoms, private property rights, and profits for a relative few. A prime example of this project was the Blue Book (so named because of its blue cover). Officially titled the “Public Service Responsibility of Broadcast Licensees,” it defined substantive programming guidelines for judging radio broadcasters’ performance at license renewal time and was the FCC’s first significant effort to clarify its public interest standard. Its purpose was to mandate that broadcasters devote time to local, noncommercial, and experimental programming, and cut down on excessive advertising. But broadcasters fought it as if it posed an existential threat, and the Blue Book gradually fell into obscurity. 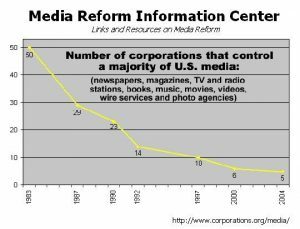 Ultimately, reformers failed in their attempts to break up media monopolies while creating a more education-oriented broadcast system. 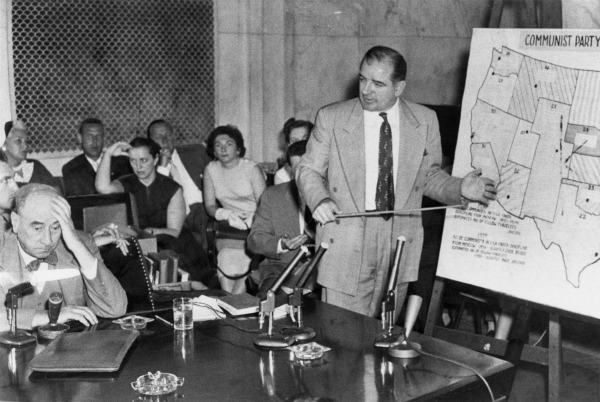 This was largely due to McCarthyite hysteria and Cold War anxieties, which became a favorite political tool used by corporate interests to beat back regulatory interventions. Reformers were accused of trying to “BBC-ize” American radio, and were denounced for being socialistic. Nonetheless, there were at least a few partial victories. For example, news media began to embrace a notion of social responsibility, and some alternative media institutions like Pacifica radio were established. Public interest policies like the Fairness Doctrine—the rule that broadcasters had to present contrasting views on issues important to local communities—created some potential for advocating public interest programming. While these reforms represented meaningful progress, they fell far short of the structural interventions reformers had initially sought. The outcomes of these debates resulted in a kind of social contract between the state, the public, and media institutions. This postwar settlement was defined by three features: self-regulation, industry-defined social responsibility, and a negative understanding of the First Amendment. This kept in place a commercial media system with little public or governmental oversight or challenges from noncommercial media. This framework continues to shape much of the media Americans interact with today. The ideological formation that keeps this arrangement intact is what I refer to as corporate libertarianism. Based on the assumption that government has little legitimate role in intervening in media markets, corporate libertarianism attaches individual freedoms to corporate entities, often elevating these rights over the rights of other groups, local communities, and society as a whole. That government has no role in media is, in reality, a libertarian fantasy: from spectrum management to copyright protections to the enforcement of ownership regulations, government is always involved.The real question is how the government should be involved. These corporate-friendly policies for radio transferred seamlessly to television, where the same networks (CBS, NBC, and ABC) dominated for a generation. To be sure, public service exceptions persisted within the commercial landscape, exhibit A being Edward Murrow’s reporting. And there is some evidence that the 1940s reform movement left a lasting cultural imprint on commercial news media that encouraged them to pay at least some attention to public service principles. But this ethic certainly did not come to largely define American news media as it had in other public media systems established by democracies across the globe. Challenges to an unregulated, heavily commercialized media system nonetheless continued, especially outside the FCC’s purview. 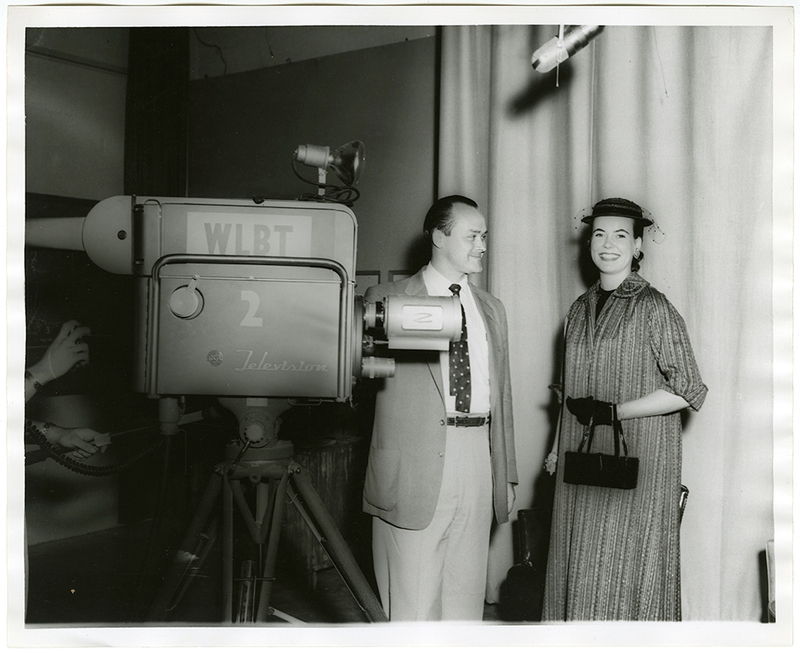 Another historic case was decided in 1969 when WLBT-TV’s license was revoked because of racist programming—one of the few times a broadcast license was ever revoked. This case was made possible after the D.C. Circuit Court forced the FCC to allow citizen groups to challenge a license renewal, thus granting citizen groups legal standing for the first time. 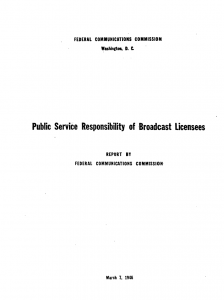 The FCC made other attempts at progressive content regulation during the 1960s and 1970s, like the 1960 Programming Policy Statement, which maintained that government could mandate public interest obligations, and the 1971 Primer on Ascertainment of Community Problems, which mandated broadcasters’ commitment to localism. Many of these policies, like the Fairness Doctrine and Ascertainment, were thrown out under President Ronald Reagan’s deregulatory push in the 1980s. The Reagan-appointed FCC chair, Mark Fowler, who became infamous for saying that television was nothing more than “a toaster with pictures,” helped reorient media policy according to a market-based understanding of the public interest. While removing the Fairness Doctrine helped usher in a wave of rightwing cable television and talk-radio shows, potential alternatives like cable and satellite became dominated by a small number of lightly regulated corporations. The deregulatory zeal that characterized media policy in the 1980s culminated with the 1996 Telecommunications Act, the first major overhaul of the landmark 1934 Communications Act. An attempt to reform U.S. media policy for the digital era, the bill passed Congress with significant bipartisan support and was signed into law by President Bill Clinton. 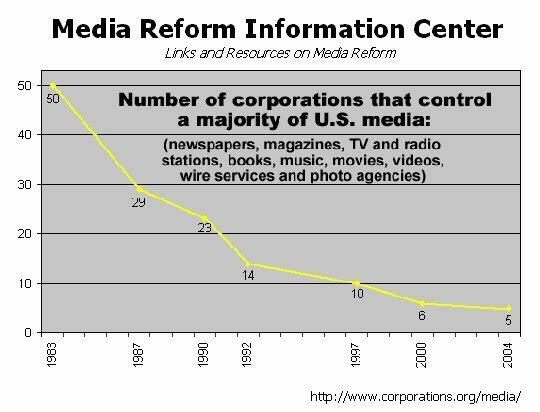 Deregulation of media companies in the 1980s and 1990s resulted in far fewer corporations with control over a majority of the U.S. media. Going beyond just telecom legislation, the bill’s broad sweep also deregulated cable rates and removed broadcast ownership limits. This latter provision led to a rapid and unprecedented merger mania resulting in media conglomerates and massive consolidation, especially in national radio station ownership. After the telecom act eliminated the 40-station national ownership cap, a series of acquisitions allowed the largest radio chain, Clear Channel, to own more than 1,200 stations nationwide, dominating most major markets and limiting the diversity of voices on the public airwaves. In understanding why media systems operate in particular ways, we rarely link patterns in news coverage to a media system’s structural components. Much popular media criticism singles out specific journalists or news organizations’ individual failures. But this suggests that the problem lies with just a few bad apples. Of course there isn’t a cabal of media owners who meet in smoky backrooms to plot their manipulation of the masses. But shoddy news coverage is a systemic problem—one that stems from the commercial pressures and profit imperatives that privilege particular types of news coverage over others. Critiques of campaign coverage are well known. Election-related news typically focuses on the horse-race aspects of politics, with an emphasis on who’s ahead and what the polls are saying with each changing minute. 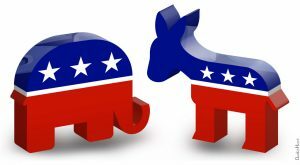 Campaign strategies, the most recent embarrassing gaffes, and outrageous insults that one candidate hurled at another, are the stuff of standard election news commentary—not historical context or information about substantive policy differences that may affect voters’ daily lives. Typical news coverage often treats the election like a dramatic football game to be consumed by passive audiences instead of a democracy-sustaining act of citizenship. While it’s tempting to blame the audience for lapping up this coverage, it’s actually more of a supply-side problem. Media do not simply give people what they want. They’re also produced to satisfy advertisers’ and media owners’ needs. Screen-to-screen coverage of Trump does not just reflect audience desires; rather, it serves as bait for their attention. Because the audience’s attention is the coveted product that media deliver to advertisers. And to keep our attention, media must entertain us. Trump performs this role wonderfully. He keeps ratings high and ad sales strong. He is pure gold for their bottom line. Conflict and controversy attract eyeballs, and our hyper-commercialized media system cares most about what sells advertising, not what informs or enriches our democratic discourse. Most commercial media organizations—cable news, broadcast news, newspapers, and digital news outlets—profit most by serving up audiences to advertisers who pay handsomely. 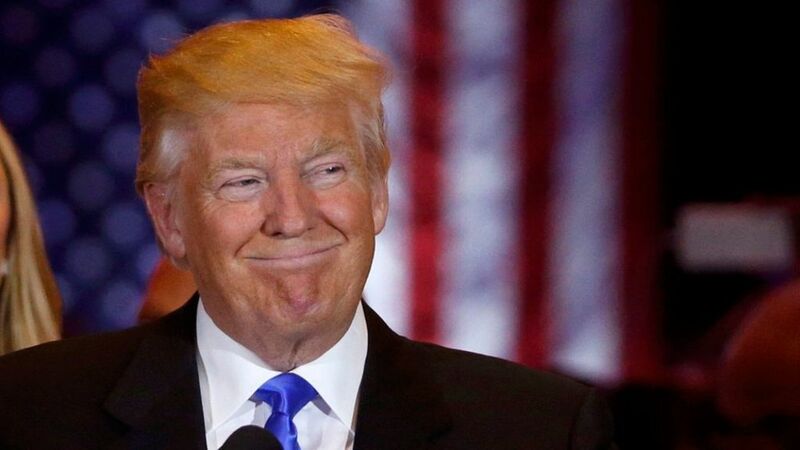 The “Trumpification of the media” exposes the commercial logic behind these processes and how news media became first and foremost businesses. It also reminds us that the current system was not inevitable—that there were other roads not taken—and we can begin to imagine that a very different media system was, and still is, possible. In the 1940s there was an alternative vision to the corporate libertarian model, and recovering this forgotten reform movement may help show the way forward. For the past 100-plus years, the U.S. has tried to sustain its experiment in commercialized journalism by treating news as both a commodity and a public service. Although a perfect division never existed, the news industry (often out of fear of public backlash and government intervention) has long sought to prevent commercial imperatives from completely overwhelming democratic necessities. Today any vestiges of that always-porous divide are quickly eroding. While television news media demonstrate this most blatantly, we are seeing similar trends with the rise of “clickbait” and other forms of digital journalism that expose readers to invasive and deceptive advertising. With ever-diminishing revenues for hard journalism, this trajectory of increasingly degraded journalism is troubling. What these problems actually call for is a structural overhaul of our media system where it’s no longer rational to serve up fluff in place of actual news. Alternative models, both from the American past and from other countries, show us that different systems are indeed viable. However, they require policy interventions to establish structural safeguards and incentives for responsible and informative media. The British Broadcasting Corporation (BBC) is a quasi-autonomous corporation partially funded by the British government. 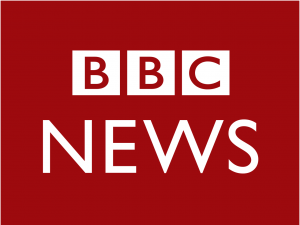 It is the world’s largest broadcast news organization. For example, the United States could follow other democracies’ lead and create a stronger public media system that actually behaves differently from its commercial counterparts. Research has shown that commercialized media correlates with low political knowledge. The required public subsidies for such an expansion could be generated through any number of creative means, including revenues generated from spectrum sales or merger conditions. We could also experiment with nonprofit news models, especially as print news media are rendered increasingly unprofitable by the market. While nonprofit experiments are beginning to take root, we could encourage proliferation via reforms geared toward expanding public service journalism that might involve tax incentives for struggling media institutions to transition into low- and nonprofit initiatives. 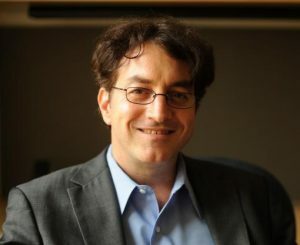 Government-sponsored research and development efforts for new digital models and public/private hybrids could provide other opportunities for experimentation. Another area for potential reform is to leverage already-existing public infrastructure to help support the production of local news content. Specifically, the U.S. could transform post offices and public libraries into local community media centers. These would not only provide news and internet access but also enable the actual production of local reporting through various media that adhered to meaningful public service obligations and high journalistic standards. Combined with a revitalized antitrust program that would prevent or even break up media oligopolies, these initiatives could reduce market pressures and help restore journalism’s public service mission. In essence, they could help prevent commercialism from trumping democracy. But these reforms cannot happen until counter-narratives, with substantial grassroots support for policy interventions, can help bring about actual structural alternatives to profit-obsessed media. The Fourth Estate’s democratic purpose affords it special protections and responsibilities. But the irresponsible news coverage that now surrounds us doesn’t comport with basic democratic ideals. Even if it’s “damn good for CBS,” the news media shouldn’t be permitted to recklessly pursue commercial interests to everyone’s detriment. History shows that this was not the media system that many Americans wanted. History also shows that we can fight for—and sometimes even win—alternatives. Robert McChesney, Telecommunications, Mass Media & Democracy: The Battle for the Control of U.S. Broadcasting, 1928-1935. New York: The Oxford University Press, 1993. Marion Marzolf, Civilizing Voices: American Press Criticism, 1880-1950 (New York: Longman, 1991). Victor Pickard, America’s Battle for Media Democracy: The Triumph of Corporate Libertarianism and the Future of Media Reform (Cambridge University Press, 2015). Allison Perlman, Public Interests Media Advocacy and Struggles over U.S. Television, Rutgers University Press, 2016. 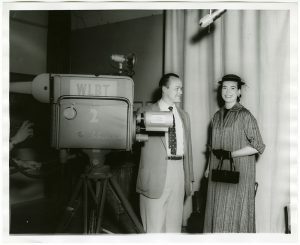 Mickie Edwardson, “James Lawrence Fly’s Report on Chain Broadcasting (1941) and the Regulation of Monopoly in America,” Historical Journal of Film, Radio and Television. 22, no. 4 (2002). Robert Horwitz, “Broadcast Reform Revisited: Reverend Everett C. Parker and the ‘Standing’ Case,” Communication Review 2, no. 3 (1997): 311–348. Inger Stole, Advertising at War: Business, Consumers, and Government in the 1940s(Urbana: University of Illinois Press, 2012).